eye can stamp: Just Moved ... and I'd love to have more German sentiment stamps! Just Moved ... and I'd love to have more German sentiment stamps! Nothing spectacular today... just a little card for someone who is going to move. I couldn't find a suitable stamp for the sentiment, so I had to computer generate it, it says "Good Luck in Your New Home". Hmmm... does any stamp company read this? I'd like to have a beautiful German "just moved" stamp, or something like "Good Luck In Your New Home" - why don't you produce something like that in German???? 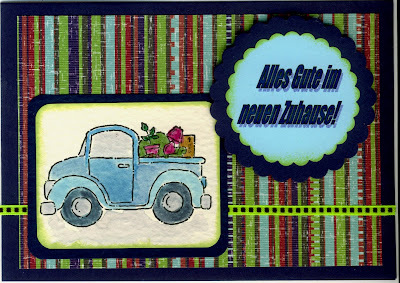 The truck stamp is by Stampin' Up, I colored it with Tombow markers and an Aqua Brush Pen. Design paper by Daisy Bucket Designs.